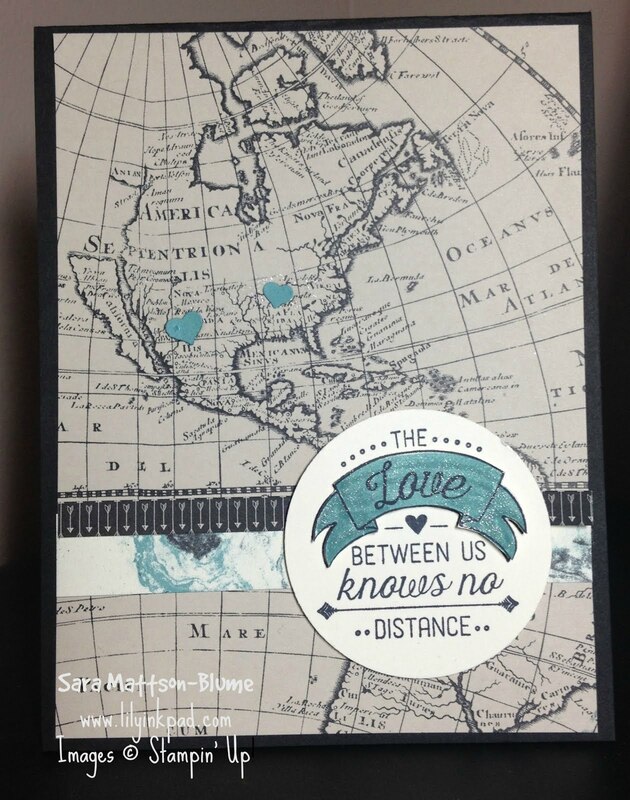 Welcome to the 2016 Stampin' Addicts Occasions Blog Hop. This is one of eight stops showcasing projects created with products from Stampin' Up! 's Occasions Catalog. You may have come from Rhonda's blog featuring Rose Garden/Wonder Bundle or, if traveling backwards, Yapha's blog featuring Bear Hugs Bundle. Either way, you are here at Lily's Ink Pad and I am featuring The Going Places Product Suite, which includes a very awesome stamp set called Going Global including the world, a compass, the Big Dipper, and some love-ly sentiments. The Going Places Designer Series Paper has coordinating patterns, but also some great oil/paint art. 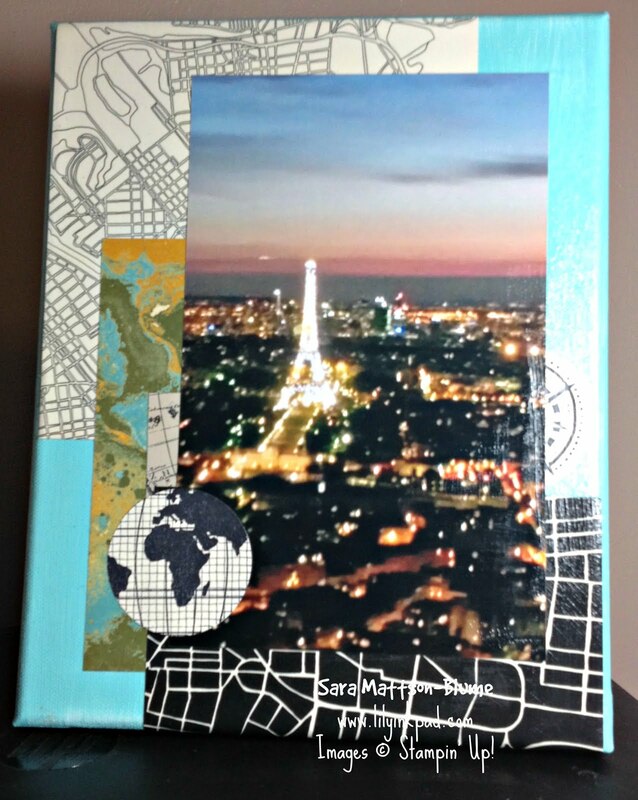 Finally, there is a World Map on the World Traveler Textured Impressions Embossing Folder. I used the Confetti Hearts Border Punch to make my map markers. Really the love of my life lives within my apartment, but this would be good if I go to another Stampin' Up! event in Utah! My next card uses the Confetti Stars Punch. I had to, right? Again, this is a great valentine, but without that pink color! I love the star paper. I added a little Wink of Stella on some of the stars, but the sparkles aren't showing up in my photo. My nephew took this photo when he was in Paris two summers ago on a school trip. I plan to give it to him for his birthday in February. I basically colored a canvas and decoupaged with modge podge. 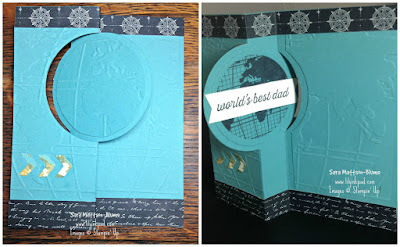 I stamped the globe and compass and punched them out and added them for fun. I had wanted to distress it more and add more layers of paint, but I couldn't bear to cover up more of the paper! My final card was designed because I knew I wanted to use the sentiment: World's Best Dad. More details and bigger pictures will be posted on my blog this week. Basically, I used the Circle Card Framelits for my base. I also used the Circle Card Framelit to cut out a matching piece that I had used the World Traveler Textured Embossing folder on. That way, I had a texture layer and and a plain layer. The rest is pretty simple to see. I will show you more tips next week! That's all I got! I ain't got no more! It's time for you to travel forward to Yapha's Blog with the Bear Hugs Bundle or you can go backwards to Rhonda's blog for Rose Garden/Wonder Bundle. Sara, I love how you used this set. Sets like these come hard for me to design with and I love seeing your great ideas. 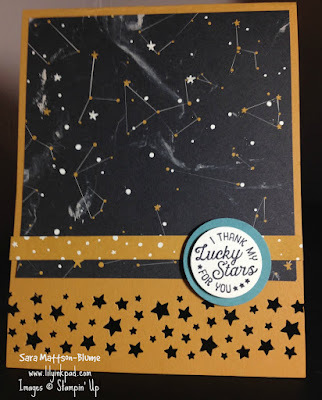 Your "Lucky Stars" card and the last "Dad" card are my favs for sure. Thanks for sharing your creativity with us! These are great, Sara! I love that star card and the flip card is super cute too! Great use of this product suite! Great projects, Sara! I really love the flip card with the embossing and how you tied in the confetti border punches with the other two cards. Love all your varied projects! 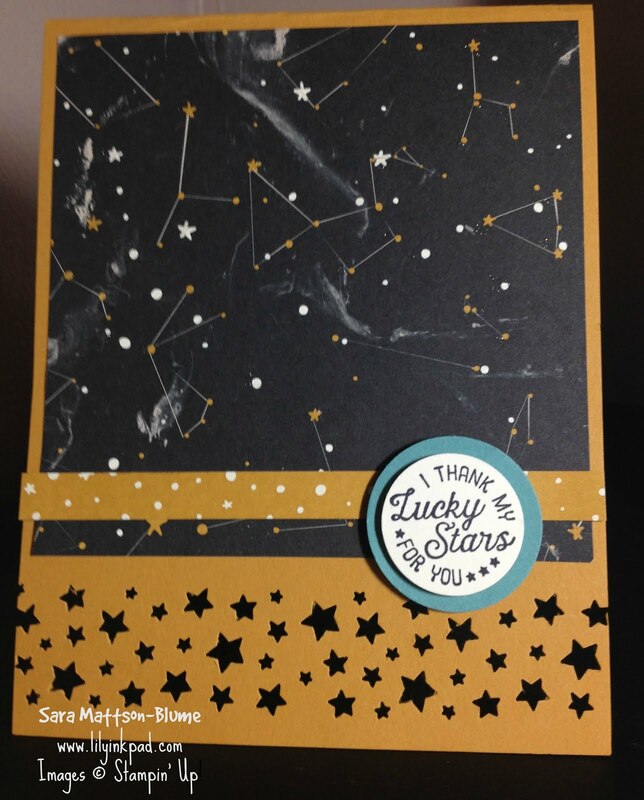 The constellation one with the confetti stars is my favorite - great combo idea! Wow Sara, you went to town with this suite! Love the mixed media gift, and it is hard to find manly Valentines :) My favorite is the last card, it is amazing! Fun! I especially like the idea of hearts on the map! Sara I love all your projects. You can send the card to him when you go to Salt lake City, UT in April!!! The color pink is always appropriate in my world! Very handsome creations!! Your friend will love the gift! !